So here’s some fiddling in GWizard. 1/8" bit at 18000 rpm (this is also the recommended speed for my Amana bit). Keeping the bit within deflection tolerances has me around 50ipm, so this is pretty analogous to slot #1. So in the video above is the first cut what people would consider a ‘good’ sound? The chips seems good, I feel like it’s close but I literally can’t tell if I should go a little faster or slower. 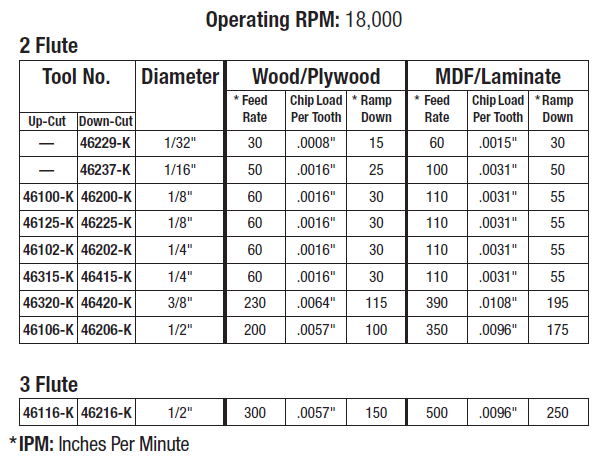 If I put in the 45ipm I was using in the video and bring my rpm’s down to 16.5k (essentially the lowest on the dewalt scale) I likewise get no deflection warning, suggesting I can either lower the rpms or up the speed to 50. It’s too late to run the machine here but still curious what other insight the community has. Also just confirmed my Amana bit is 20ipm but at 1D or .125" depth, I’ll have to setup a test testing gwizard’s numbers as well as Amana’s, but since it’s roughtly 2x the passes at 1/2 the speed it should be pretty comparable aside from time spend plunging. And yes they’re talking about router based spindles also. Sigh. Which is fair, they sell them they don’t make them. The Amana 46225 has a similar profile to what I’m using aside from a) being a 1/4 shank and b) not having the pretty coating on it, but it’s also like $20 cheaper so no real complaints there. 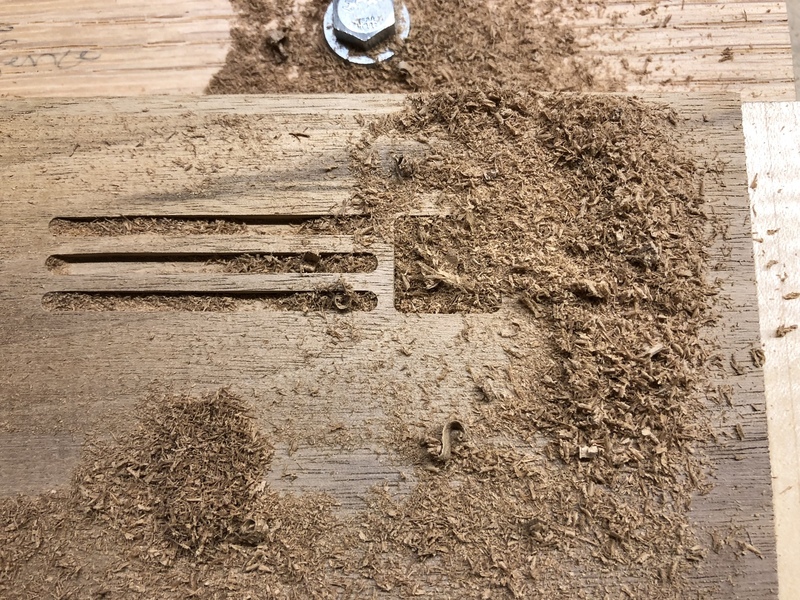 It also has a F&S recommendation of 60 ipm in wood or plywood with a chipload of .0016". Once again their chart could use a recommended step down in my opinion but these are more reasonable numbers. It seems like the charts still make assumptions about the operator and the machine, which is fine I know there’s infinite combinations of both, but I’d like to see more of those assumptions stated. You’re supposed to take a depth of cut the thickness of the material when using an up/down end mill? Didn’t know that. How is that feasible for any material thicker than 3-4mm? I was under the impression you’re not supposed to go much more than half the tool diameter? 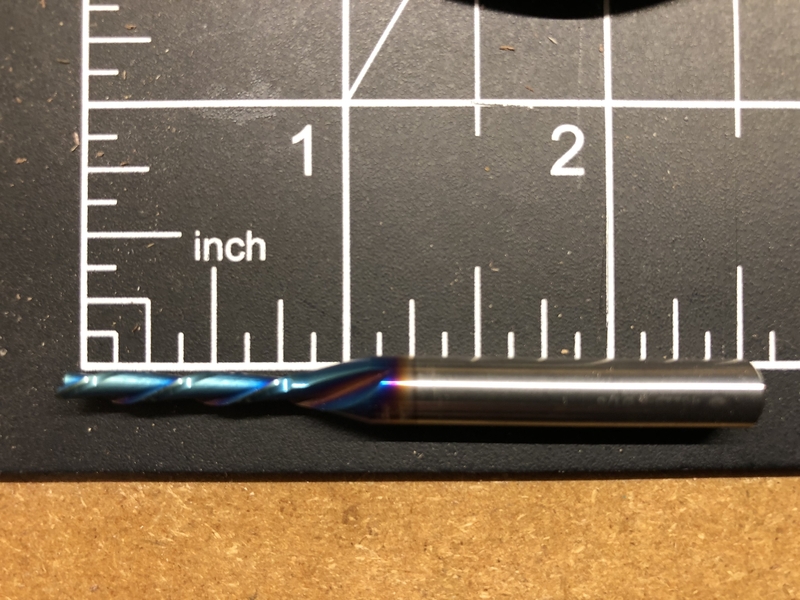 The most I’ve gone with a 1/8 end mill is around 2mm and even that felt too much in terms of the noise I was getting. 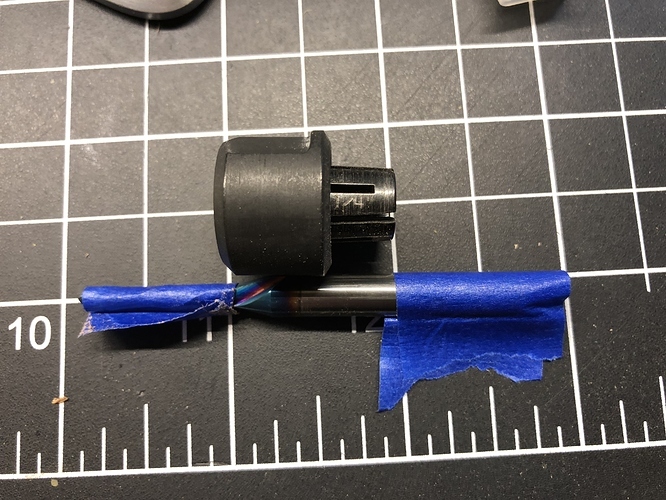 Well so the compression bit has a really low chipload, where most up/down cut bits are .003"-.005" the compression bit was .0005" a full order of magnitude lower. This is apparently, despite being noted NOWHERE on the sheet, them assuming you’re taking much deeper cuts. Also means slotting operations would be difficult but it explains the 20ipm speed suggestion a little more. I think the intent is you rough it out and then just do finishing passes at full depth. I was trying to rough out and finish pass with the same bit. Ordered the bit I mentioned, similar profile just 1/4" shank, similar cutting properties but solely downcut. Free next day delivery from ToolsToday and same price as amazon. ToolsToday got me the bit as stated the very next day. Coincidentally McMaster-Carr I just ordered from for the first time, ALSO got me my item next day for the price of ground shipping. Well done folks. Going to try 1/2D @ 60ipm, 1D @ 60ipm, and probably an intermediate setting as well. If you increase your router speed (from 18k to 27k RPM), you should be able to increase your feed by a factor of 27/18 = 1.5 and achieve comparable results! 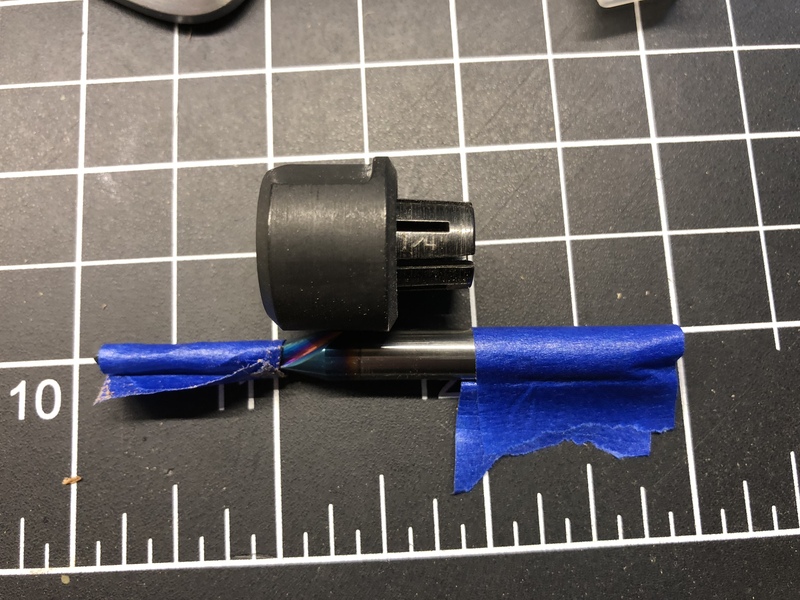 Because my project is physically very small it includes numerous direction changes and I suspect I’d have trouble maintaining an actual 90ipm speed, end up running the bit too fast and wearing it out sooner. OK, but note that increasing router speed decreases router torque and forces for any given feed rate. IMO those are more significant issues than carbide bits wearing out. Fair enough, I’ll experiment but I generally found I got deflection artifacts with higher feeds even at higher rpms, hense my journey to try and find out the proper way to at least estimate. Once I run those tests I’ll try pushing it a bit more. Those deflection artifacts are likely caused by the forces on the machine and not the bit. You might want to view https://www.cnccookbook.com/spindle-speeders-speed-increasers-and-high-speed-attachments to see what some are doing to increase aluminum milling feed rates. Well putting this together for a test today. Using their numbers of 18000rpm and 60ipm I get huge deflection warnings, 300%+ over the desired number. This is also for slotting so that may be the issue. 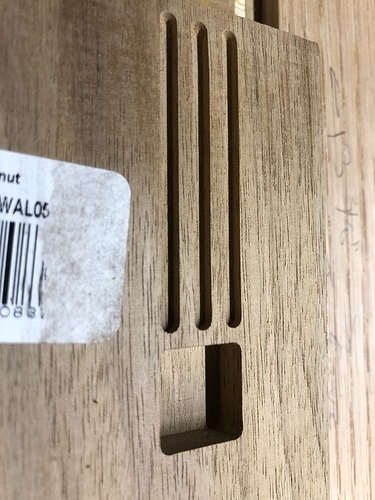 Okay so playing with the numbers, stickout is a huge component of deflection, I had that at around 1-1/8" but I don’t need that much exposed, the full depth is nominally 3/4" and the cutting threads are 13/16" (.8125") so I’ll put the number at .9 and just eyeball it during setup to just above the stop of the cutting threads. Awesome so that immediately dropped my deflection warning in half to 168%. Let’s see how various adjustments can help it. So those are all about even, a 10% adjustment to a relevant number produces a roughly equivalent 10% drop. Because my final product is me cutting out a hexagon the machine is reversing both axes fully across only a 2" area, so I suspect maintaining the ipm listed would be difficult for the shapeoko. To account for machine stiffness problems I feel I want to pull back a bit on the cut depth. So I’ll try dropping feedrate to 50ipm and cut depth to .1". Okay not bad, that got me down to 112% of the recommended roughing deflection. I’d probably be okay at this point, these are all just estimates anyways. But I also want to make sure I’m getting good cycle times so I’m going to go back to the first number I punched in, the stickout. I can easily calibrate stickout by positioning the machine next to the wood I’m going to cut, putting the bit loose in the collet, and then using the jog controller to lower the collect carefully until it’s just above the workpiece. I can mark the bit with sharpie or just try to tighten the collet in place enough to hold the bit, then lift it and finish tightening it. So let’s go back and lower our stickout to 0.85", should probably be less than that using the above method but a little margin for error seems good. Okay there we go, 94% deflection so right where I want to be. The estimated chipload is .0014" which is right around manufacturer specs of .0016". So that works for slotting, finally I’ll reduce the radial engagement to see how pocketing should go. 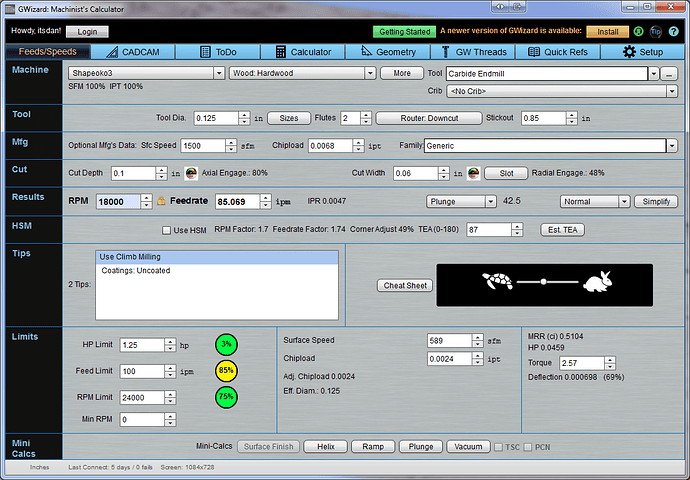 Essentially the machine maxes out at my imposed limit of 100ipm before I get any deflection warning. I don’t hear as much chattering as I did before, the three lines are .1” @ 50ipm, .1” @ 50ipm with ramp in, and .08” @ 50ipm. The cut came out absolutely gorgeous. Everything produced chips on the small side so I could probably increase feed rate a touch. Once I dial that in I may experiment with higher rpms and proportional feed rate increases. The pocket is .1” at 70ipm with a ramp in. Oh and one issue with stickout I’m curious about other people’s opinions on. I realized my plan to reduce stickout was an issue because the cutter and shank diameter change. I did follow through with my plan to setup the depth by aligning it with the wood, which worked well, but some of the collet is now jus grabbing air because the transition between diameters happens higher up. What do people think is more important, reducing stickout or maximizing collet ‘grab’. I need to pull the collet off and visually see how much it was still grabbing I think. 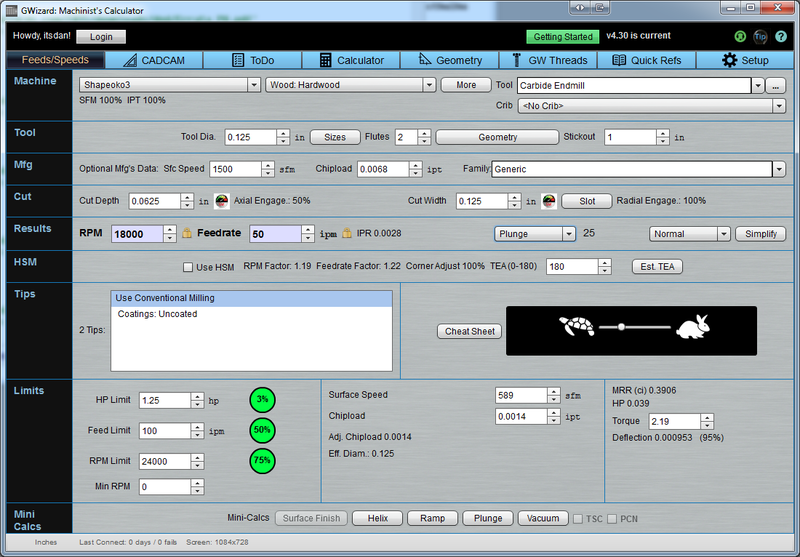 Stickout for GWizard’s bit deflection calculation would be approximately the bit’s cutter length (13/16 inch). as depicted in the geometry window it appears to be everything below the collet, but there’s an area here which even if it’s in the collet wouldn’t be grabbed by it. I’m going to go check in a few to see how much of the actual shank is engaged with the collet. 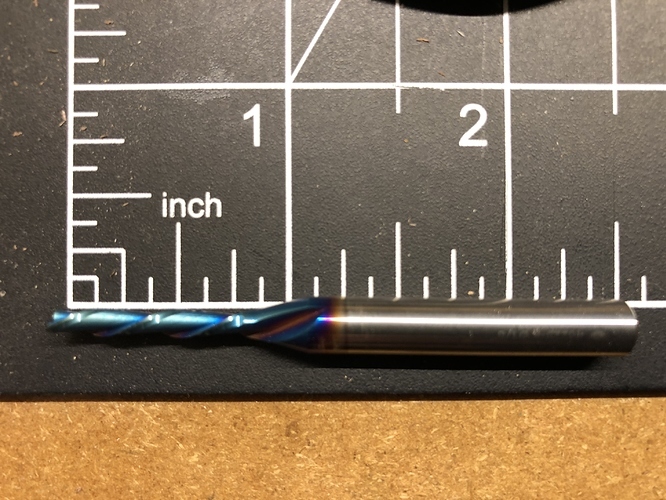 A decent amount was still engaged with the collet, I might back it out slightly so a little more is, at the cost of a little more stick out, but I think it will be fine. 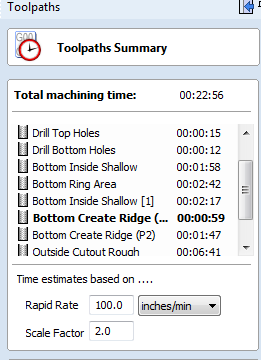 So in summary, .1” seems good to me, going to stick to 50ipm@18000rpm as my baseline and perhaps increase from there proportionally but I got high quality cut results at much higher feeds especially for pocketing where I think I’ll save a lot of time. I don’t see much effect ramping into contours but I do like it for pockets. Alright, that’s a decent improvement to start with. Knocked 10 minutes off the cycle time. I hadn’t set the final pass to be a single full-depth slow pass. Doing that dropped it down further. The geometry window is for a shank the same diameter as the cutter. Your shank is twice the maximum diameter of the cutter and hence more than 16 times stiffer than it.